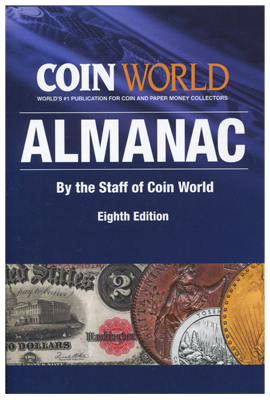 The Eighth Edition of the Coin World Almanac is a massive one-volume, 700 page reference that places vital coin collecting and industry specific facts that you need to know right at your fingertips. The Eighth Edition of the Coin World Almanac is a massive one-volume, 700 page reference that places vital coin collecting and industry specific facts that you need to know right at your fingertips. Th ebook features chapters on topics such as the United States Mint, U.S. Coins, World Coins, U.S. Paper Money, Counterfeit Coins, Grading Coins, Numismatics and the Law and much more.